Chemical fogger or humidity control is simple with the Commander "Tri-Jet" Fogger. The combination of adjustable valve and the tornado action nozzle allows you to maximize mist up to 30 feet directionally. The versatility of this unit allows you to fog with both water and oil base materials and may be used either indoors or outdoors. 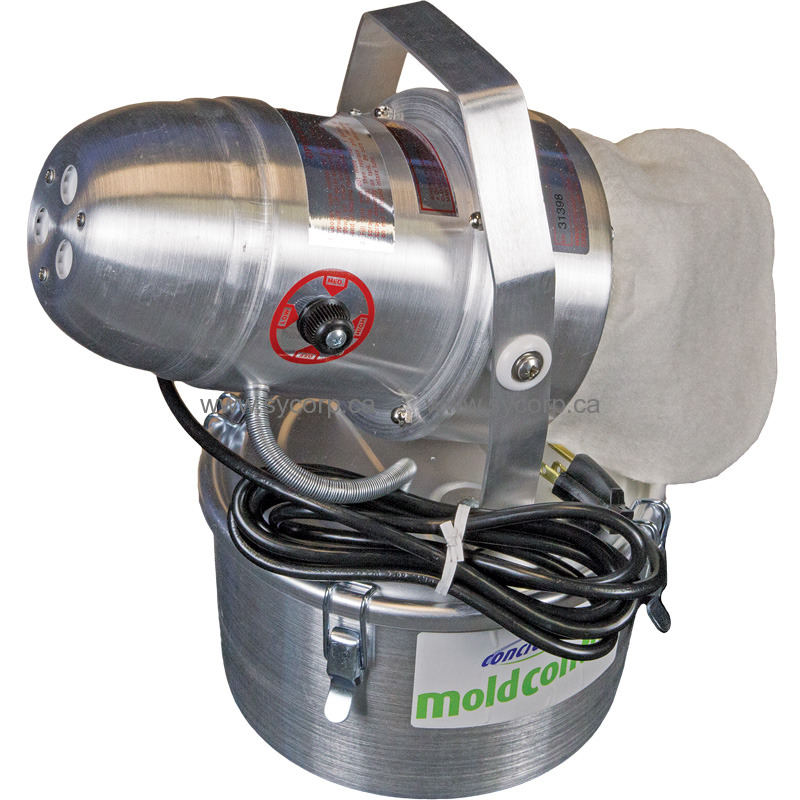 Applying Concrobium Mold Control with a cold (ULV) Fogger is an effective way to eliminate mold and musty smells in large or inaccessible spaces. A fogger evenly mists Concrobium Mold Control to saturate the air in the enclosed environment, and evenly coat all surfaces. Concrobium Mold Control effectively eliminates and prevents mold growth on a variety of surfaces. Fortunately, for those hard to reach surfaces and large enclosed areas, a fogger lets you mist Concrobium Mold Control to evenly coat the surface, crushing the mold spores as it dries in an easy to use application method. Add Concrobium Mold Control to fogger tank. Remove or cover any room contents that may be damaged if wetted e.g., furniture, electronics, electrical sources, paper products. Close windows and doors. Position fogger in space being treated and adjust fogger head angle to ensure even application of the affected area. After fogging, allow fog to dissipate for 15-20 minutes. Where possible wipe off any excess wetness from surfaces with a clean cloth. Allow surface to dry overnight. Do not rinse. If over application occurred, a harmless white residue may remain on surfaces. It may be necessary to wipe some surfaces clean after drying e.g. glass, mirrors. Well built, performed far better than I ever expected. Highly effective and easy to operate This product does what it claims. I highly recommend this fogger for those who have areas like attics or basements, hard areas to get at. A great investment.